The Therm-a-Rest Honcho Poncho is a waterproof/breathable poncho with a thin layer of 37.5™ polyester insulation that is just enough to keep me snug while doing camp chores or sitting around a campfire chatting with friends. The poncho includes a perfectly-situated insulated kangaroo pocket in front, topped with a zipper pocket that doubles as a stuff sack. There are snaps along the edges to hold the sides together and help trap in some heat (somewhat) on the sides. The hood has a drawstring to cinch up the opening for a more snug fit. When stuffed into its zipper pocket, the Honcho Poncho converts into a nice pillow. The poncho can be unsnapped and opened to be used as a blanket, or stuffed into itself to create a pillow. I love multi-use gear and the Honcho Poncho really works well when moving about camp and in a hammock. 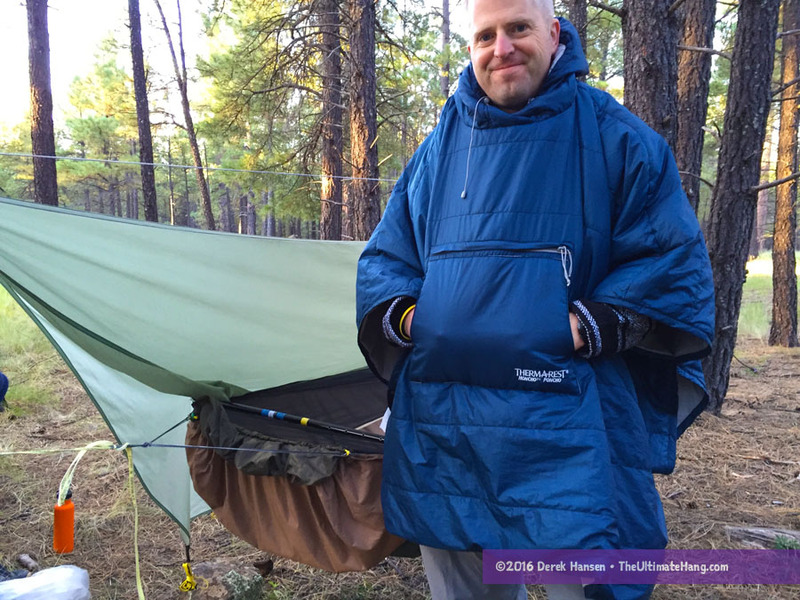 During the late summer months when I first received the Honcho Poncho, I used it daily to snuggle up in my hammock. It was just enough insulation to keep me cozy without worrying about overheating. When opened up and folded length-wise, the snaps perfectly aligned so I could snap it into a pseudo-sleeping bag with an open foot end. This provided enough venting to be very comfortable. During this trip, I only used the Honcho Poncho as my sleeping insulation. It got down to the lower 40s°F and I was cold. During warmer trips, the Honcho Poncho worked fine as a blanket. The included kangaroo pocket and hood really make this poncho a winner for me. It’s been great for around camp, but also in the living room for getting wrapped up and cozy while lounging about. I love that I can convert it into a pillow or a blanket/sleeping bag. I think it is sized just right for wearing as a poncho, but also as a blanket. While I loved that the snaps aligned, I wish there were a few more, particularly around the short sides so I could snap closed one end for my feet. If there is one DIY update I’ll make to this item will be to add a few snaps to the edge. On one trip in the fall, I used the poncho as my primary insulation. Temperatures dipped into the low 40s°F upper 30s°F and I was cold. I was wearing insulated pants and my light jacket. While Therm-a-Rest does not market this as a sleeping bag and provides no temperature rating, I would say that it would be good in the 50s°F or higher when used this way. Construction and Craftsmanship ♥ ♥ ♥ ♥ ♥ Very impressive construction, which I’ve come to expect from Therm-a-Rest. High-quality throughout. Modularity ♥ ♥ ♥ ♥ ♥ While you can easily use the Honcho Poncho as a blanket, it lacks sufficient snaps to fully convert it into a sleeping bag or top quilt. Price and Value ♥ ♥ ♥ ♥ ♥ I think it is priced just on the edge of it’s value. Interesting product review. Keep up the good work!